This was not an easy book for me to read. The language is easy enough and the target audience of middle schoolers will have no problem it, but as a mother, particularly as a mother with an infant sleeping upstairs, this was not an easy book for me. Son is the fourth and final book in the "series" that began with The Giver back in 1994. Son goes back to the time period and story told in The Giver but tells it from a different point of view. Instead of Jonas's tale of the perfect society with a secret, we have Claire's tale of the secret. In this strange utopia there's no pain or fear or conflict and everyone has a role to play in the community. Claire's role is of birthmother--an important albeit unglamorous job--until she has complications delivering her product and must have an emergency c-section. Removing pain and fear from society has also removed love and joy. Birthmothers deliver their products and caregivers apply to adopt them. There are no bonds between mother and child which is why Claire is completely unprepared for her feelings of love and care for the baby she had to give up. She does the unthinkable and locates him in the nursery and attempts to connect with him--without attracting too much attention to herself. The baby is designated "failure to thrive" because he doesn't like to sleep or stay quiet and just when Claire wonders if she should try to take him and escape the village, her baby is taken by a boy on a bicycle. She doesn't hesitate to jump on a trading boat and try to follow. We know from The Giver who the boy is and who the baby is and we know from Messenger that they survive their journey. But Son is Claire's story. So we watch as her boat is ravaged in a storm and she washes ashore in yet another strange community. This community is missing the sterile technology of Claire's home and is full of people having *feelings. * Claire has amnesia from the storm and is able to assimilate into society before she remembers her former life and the baby she needs to find. Once she does remember it still takes years for her to be physically strong enough to climb out of the valley the community is in so she can begin her search. Son answers many "what" questions from the previous books and ties all of them together, but not many "why" questions. We still don't know why there are all of these little communities that are so remote from each other and so vastly different. But it doesn't really matter. 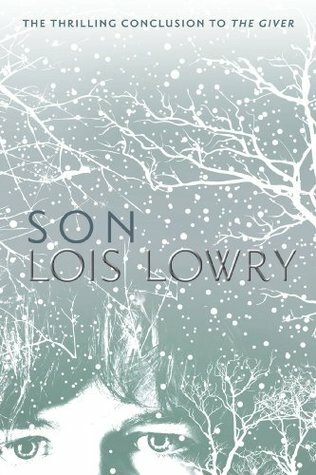 Reading Son does not make one think about what the apocalyptic event occurred to fracture this society could be, reading Son makes one's heart beat faster wondering if Claire will find her way out and find her baby. Although we know that the baby grows up and is well taken care of (from Messenger), we don't know whether Claire ever makes it or not, and that consumes us as we read her story to find out. It is not unreasonable for kids to read Son and any of them who have read The Giver will certainly want to finish the story. But the fast heart beat, sweaty hands, nervous reading will probably be reserved for the mom (or dad, but probably mom) who truly understands the deep emotional connection made with motherhood and how mothers will do anything for their children.